Pasang with her older sister’s husband who came to collect her and bring her home after 7 years in Umbrella. 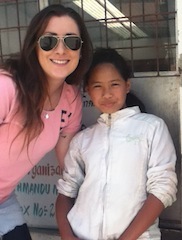 When I met Pasang, it was my first day as a volunteer in Sagarmatha house. She was the first girl to come over to me and introduce herself. I liked her instantly: she was funny and full of life. She was a happy girl and very popular amongst the others in the house. Eventually she told me her real name was Pasang, and for short I called her Pashie! She loved this and it quickly caught on. As my time went on in Sagarmatha, I got to learn some of the girl’s stories, how they ended up with Umbrella, and whether they had family outside or siblings also in care, but never did I hear any mention from Pasang about her life beforehand. This didn’t ever play on my mind, quite the opposite actually: I never even gave it any thought. I just considered her as an orphan, brought to Umbrella when she was very young, and now this was her family. The older girls really looked after her and treated her like their little sister. The way they took care of each other was lovely, and I too began to play the role of a big sister. I didn’t even know how to respond. My first thought was that they were playing a joke on me – they had to be. 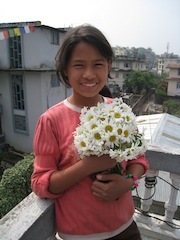 Asking Pasang, she just had this smile on her face and nodded her head in the typical Nepali way yes/no/yes/no. They’re definitely joking, I thought. Srijana, one of the girls, insisted that they were serious and I could ask anyone. I got up told the girls I would be back in half an hour, and ran home to cry. I did not want them to see me so emotional but I just could not believe it. Later that evening after eating dal bhat, the girls and I went up to the bedrooms to sit around, do each others’ hair, and tell stories about anything and everything they could think to ask me about. But this time it was my turn, and I asked Pasang about her family. I was curious to know about them, who they were, where they lived, all of the details I take for granted knowing about my own family. She told me they lived about a half hour away, and she would be reintegrated with her father and older sister Pinky. She said she had another sister who was married who lived beside them also. I said “And Mum?” Pasang replied “No.” that was all I learned that day. It was vague but I knew that’s sometimes how it is here. I asked when she would be leaving, selfishly hoping not for a few weeks, but nobody was sure. They told me maybe Wednesday, maybe Thursday, much sooner than I expected. I felt so excited for her but also so devastated that only after a month here I was already having to say goodbye. The next day all the children were starting the first day at their new school. 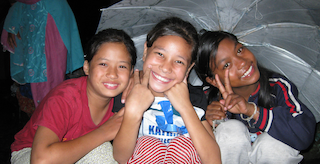 I walked over to Sagarmatha to see them all with their bags packed and hair done in braids ready for a new adventure. They were very nervous about the move but they lined up, called out their numbers, and started to walk. That’s when I noticed – no Pasang. I ran into the house to look for her and saw her sitting in front of the TV by herself. “Are you not coming to school Pashie?” I asked. “No” she replied. “Are you going home today?” I questioned, my heart racing. “I don’t know, sister” she responded without lifting her eyes from the TV. As I walked the other girls to school my stomach was in knots, I couldn’t help but to think, what if she was not there when I got back. Pasang and I spent all day Wednesday, Thursday, and Friday sitting in the house by ourselves waiting for the phonecall saying her family was on their way. It never came. I enjoyed those three days so much, just the pair of us being silly, watching movies, playing Carrom board and bonding. She was the same girl: the news of her going home had not changed her at all, though it had changed me. I went to bed on Friday feeling sick. The emotions of last few days had taken it out of me. I wasn’t sleeping right, waiting on the news that she was going. I woke up Saturday absolutely sick; I didn’t want the girls to see me like this so I stayed in bed for an extra couple of hours to try to shake it off. Then my phone went off and I knew right away. It was a text from Mac. “Hey, Louise, don’t know if you’re about but Pasang is off now.” I jumped out of bed so fast, threw on the closest thing to me, and ran as fast as I could to Sagarmatha. Mac was standing outside the house. All I could think was that I was too late, but he pointed down the road as if to say you can catch her. I was already crying – there was no way I could stop. Then I saw her and shouted “Pasang”. She turned around and ran to me shouting “Sister”. She was also crying. We hugged each other for a solid 5 minutes, I could not let go of her. She said “I thought you weren’t coming to say goodbye”. My heart just broke. I told her how much I loved her and if she ever needed anything I would always be here for her. I told her how excited I was for her new adventure back to where she belonged with her family. Her sister Pinky and her brother-in-law were there. I said hello to them, they seemed like a very nice family. And I was so happy to see Pasang going home to them. Later that day after dal bhat, I was getting my hair braided by Dolma up in one of the bedrooms and henna done on my hand by Buddha. There were about ten of us there all just sitting around. There was a strange feeling in the room and I could see that Pasang was clearly missed by them all. I decided to ask about her. Buddha decided to be the one to speak. “Do you know how Pasang was lost, sister? Do you know how she was found, sister?” she said as she continued to henna my hand. “No. Tell me her story” I said. “Pasang came to Umbrella when she was a little girl, she was lost by herself. She has been here for a long time and never any word from her family. Bhimmaya was in school a few grades above Pasang and made friends with this girl. Bhimmaya thought she looked like Pasang. Her name was Pinky. Bhimmaya told Pinky about Pasang, that they looked very alike. Pinky went home one day and told her older sister that there was a girl in school called Pasang that looked the same as her. Her sister told Pinky that they used to have a little sister called Pasang but she was lost. Bhimmaya took Pasang to meet Pinky and the older sister; the older sister recognised Pasang as her sister,” she recounted, not even looking distracted from the henna. I could not believe it, how they could be in school together and not know they were sisters. It was incredible. Just then Bhimmaya walked into the room and sat on the bed beside me. I asked her about the story, and asked if it was true. She said yes. “Bhimmaya do you realise what you have done?” I said. “You have given Pasang back her family! Such an amazing thing you have done. I am so proud of you.” I gave her a big hug and she started to cry. Through her tears she said, “Pasang is my best friend.” Then I began to cry for the first time in front of the girls. I went home that evening emotionally drained by her story. It is just remarkable how she was found. Since being reintegrated with her family she has come back most Saturdays to see all her extended family in Umbrella and has even brought Pinky along. They are so alike it is mind-blowing. She says she is happy at home and I can really see it in her eyes. All the girls are delighted for her and every time they see her they tell her how beautiful she looks in her new clothes. She, and all of her sisters at Umbrella, are lucky her home is close enough that she can come visit so often. Herself and Pinky are able to join the rest of the girls swimming, and just yesterday she stopped by to say hi. Pasang receiving Tikka at her leaving ceremony in our Sagarmatha home. Every time I see her I cannot help but be incredibly proud of this wonderful girl and her story. Click here to learn more about reintegration.